Freakonomics came out earlier this September on iTunes theater nearest you. The book that made economics mixed with sociology logic more tangible to the public gained so much popularity that it's been made into a movie. Authors Steven Levitt and Stephen Dubner have done it again: They've gone and taken case studies just like in the book and have connected the dots in movie form this time. And the writers did not come unprepared. They've done their research yet again--teaming up with Academy Award nominee directors such as Rachel Grady and Heidy Ewing (Jesus Camp), Morgon Spurlock (Super Size Me), and Academy Award winner Alex Gibney (Enron: The Smartest Guys in the Room, Casino Jack and the United States of Money) among others. Ironically, Magnolia Pictures the distributor of the film, decided to collaborate with Apple to release the documentary on the little screen prior to hitting the big screen premier. 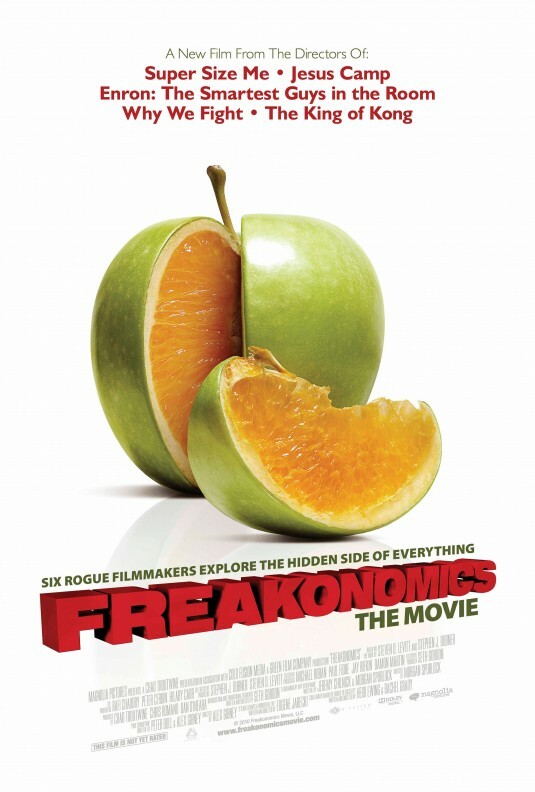 Freakonomics participated in the Tribeca Film Festival that took place in New York City last winter, when the festival made history to show the participating films live on-line or on cable's on demand simultaneously with the theatrical events. In an attempt to reach out to a larger audience outside of the independent box, Freakanomic's producer Chad Troutwine said in a press release, "The Freakonomics distribution model embraces technology, allowing the film goers who understandably prefer a theatrical experience but, to also reach a wider film audience who consume content through digital platforms." Would this be the beginning of the new digital evolution for film? Who knows. But we aren't surprised that iTunes is in the middle of this possible phase out transition--being responsible for the extinction of floppies and Cd's and all. As the book movie says: Incentives matter. On that note, have a watch at the trailer (below). And if you like it, you're just a couple of clicks away. Otherwise, the movie will be out on October 1st in a theater near you.